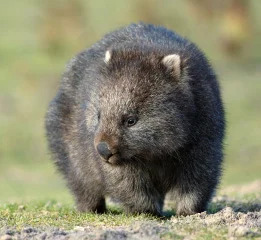 Also known as the course-haired wombat, the common wombat is the largest burrowing mammal and the second largest marsupial averaging 90-115 cm (35-45 in.) in length. Its solitary, nocturnal nature makes the wombat a rare sight for people in the wild. The common wombat’s hairless nose, smaller ears, rounder head, and longer fur distinguishes it from hairy-nosed species of wombats. Resembling a small bear, the common wombat has coarse, bristle-like fur that ranges in color from sandy hues to darker browns and blacks. 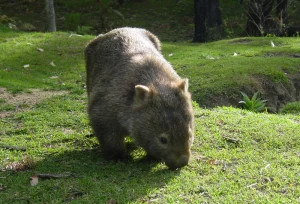 Preferring wet, forested areas with slopes (for good burrow drainage), common wombats inhabit the southeastern coastal regions of Australia, including eastern New South Wales, eastern and southern Victoria, southeastern South Australia, and the whole of Tasmania. Wombats are territorial animals. They mark their home range by grunting at intruders, rubbing their scent on trees, and scattering cube-shaped droppings. The unique shape of their dung helps keep the markings in place around their territory. With a tough barrel-like body, short powerful legs, and long flat claws, the wombat walks with a shuffling gait but is extremely adept at tunneling. A common wombat may have up to twelve burrows in its home range with three to four main burrows. A main burrow will house a network of subtunnels, which include multiple entrances and sleeping quarters. Most of the time, wombats remain in their burrows to stay out of the heat. However, they venture out at night and in cooler mornings and evenings to graze. Their diet consists of grass, shrubs, roots, bark, and moss. To accommodate their fibrous diet, their teeth grow on a continual basis to balance out the constant wear. Wombats breed on a seasonal basis. Their mating is timed so that the most vegetation is available when the offspring is ready to be weaned. 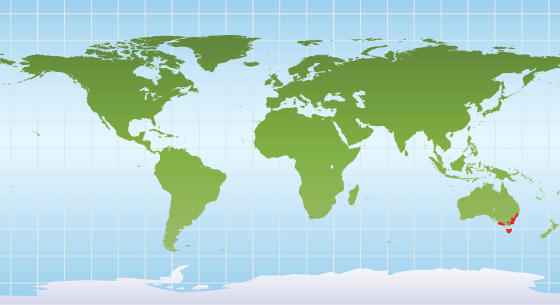 In that sense, the latitude and altitude of a wombat’s territory will determine the best time to mate. However, mating generally occurs in the winter months. Wombats’ gestation period is 20-30 days. Like all marsupials, babies continue their development in their mothers’ pouches. Wombat pouches face backwards, with the opening located towards the hind end, so that that dirt doesn’t get inside when burrowing. When a joey is born, it will crawl into the pouch and attach itself to a teat. The teat will then expand in the baby’s mouth, locking the joey in place. The joey will remain in the pouch for 6-8 months and will fully mature at 2 years old. In the wild, wombats generally live around 5 years, but in captivity, their lifespan can reach as much as 30 years. Common wombats are classified by the IUCN Red List as a species of least concern. 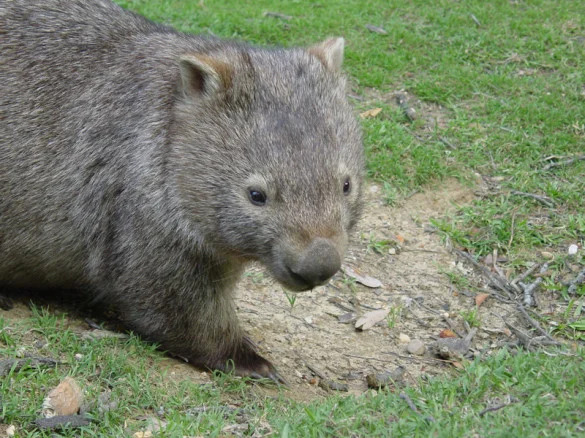 However, wombats are protected by law in Australia, except in Victoria where they are viewed as vermin because they destroy rabbit-proof fences. There are several things you can do to save wombats. Help protect remaining wombat habitat by supporting more frequent thinnings of pine plantations. 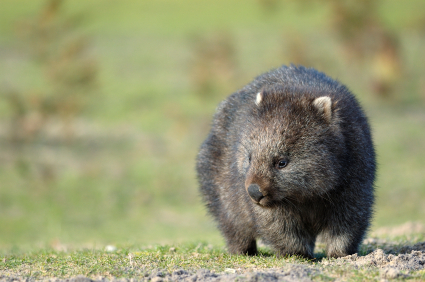 Pine forests block out the sunlight required for vegetation to grow that wombats graze on. Furthermore, when deep plowing occurs before planting new pine trees, wombats are killed, and their burrows are destroyed. Scaling back dense pine forests while preserving existing eucalyptus forests allows for more ideal living conditions to exist for wombats. You can also educate others about wombats. Many people view wombats as rodents due to their appearance. In turn, wombats are slapped with negative connotations and assumptions that they’re capable of population explosions. In actuality, it is difficult for wombat populations to recover from setbacks because wombats produce only one offspring every 2 years. Common wombats inhabit the southeastern coastal regions of Australia, including eastern New South Wales, eastern and southern Victoria, southeastern South Australia, and the whole of Tasmania. Wombat Protection Society of Australia, Ltd.